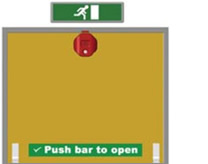 The STI 6400 exit stopper is a self contained, compact alarm designed to provide a warning to others when an emergency fire exit door has been opened. 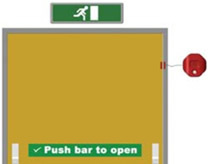 The alarm acts as a deterrent against unauthorised use of emergency fire exit doors, and the 97 dB sounder can only be silenced by a key holder, when the alarm is reset. These units can be installed in minutes and are ideal for retrofit applications. 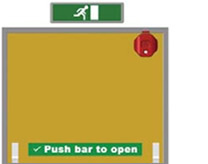 The exit stopper is fitted to the wall next to the opening of the door. The reed magnet is fitted to the door. The exit stopper is fitted to the top right of the door leaf (latch side) with the reed magnet fitted to the door frame. The exit stopper is fitted to the top middle of the door leaf with the reed magnet fitted to the door frame. 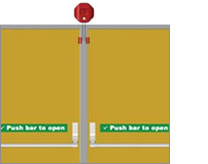 The exit stopper is fitted to the top left of the door leaf (hinge side) with the reed magnet fitted to the door frame. 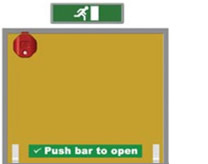 The exit stopper is fitted to the wall next to the opening of the door with the magnetic reed switch installed onto the frame. The reed magnet is fitted to the door. This is the technical data for the Exit Stopper Door Alarm - Single Door - STI 6400.
seems sturdy enough - and loud! Easy site to navigate, delivered on time!